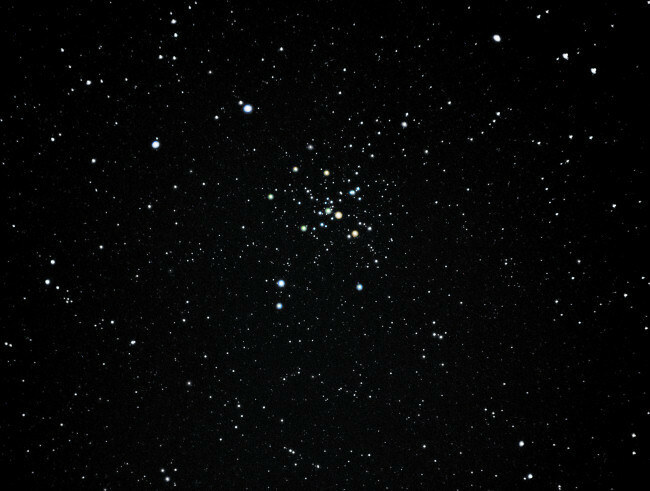 This is an image of Messier 41 in Canis Major. It is a large cluster of stars, slightly bigger than a moon's width across with lots of interesting outlying stars. This is why I used the guidescope. There are just 10 x 15sec exposures. In the telescope some of the brighter stars have an orange hue. The cluster through the telescope looks to me bit like an 'asterix' (*). Neither of these really come through in the image. M 41 never gets very high from the UK, and this is the best time to see it in the evening. Re: Jewel in the Dog's collar. I've snapped it a few times but not as good as yours. It looks amazing when overhead from Chile, Kiwiland or Down Under. I imagine it looks better even at Mediterranean latitudes. Still, let us be thankful for small mercies . . . it never rises in northern Norway.